Two weeks from tomorrow, I will be going to Las Vegas to see four New Kids on the Block concerts! The only shows they are playing in the U.S. this year! Four years ago I saw NKOTB in Vegas as they opened their CasiNO-Tour at the Pearl Theater in the Palms on May 7th and 8th in 2010. It was the only time I have had GA (general admission) for an NKOTB show (except for the MixTape Festivals), and it was my first experience with the NKOTB After Party. For the CasiNO-Tour opener on May 7, 2010, I was in the GA line by 6:15 and wasn’t too far back. Dressed in my Jordan Boyfriend tee shirt, I grabbed a spot front rail at the stage on the side – so close! The concert was great and better musically than it was when I saw them the previous July in Memphis, but it was shorter (only 1 hour 15 minutes) and I wasn’t crazy excited like last year. I did touch Jordan though. (Sigh!) “Step by Step” was still my favorite, but the acoustic version of “Single” that night was fantastic! NKOTB invited everyone to their After Party at Rain – free admission with our concert ticket. This is a place I would never ever go to, but since Jordan was going to be there so was I. The concert was over at 9:15, and Rain didn’t open until 10:30, so we had to wait in line. Inside was everything I hate – wall to wall pushy drunk whores and jackasses. Finally at midnight Jordan, Danny, Joey, Donnie and Jon arrived – and went to opposite end of the room from where I was. Oh well. 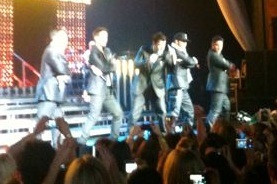 From their balcony, I got to see Jordan dance, Danny flirt, Donnie work the crowd and Joey make out with his wife. I have no idea where Jon went. Around 12:30am, I couldn’t take it anymore. Too tired to walk back to Rio to grab the last free shuttle, I took a cab back to Ballys. I hadn’t eaten since 2pm or drank since 5pm, so I drank 2 bottles of water and ate a little candy when I got back to the room. Poor Cindy had to listen to me gush about my night with the New Kids. 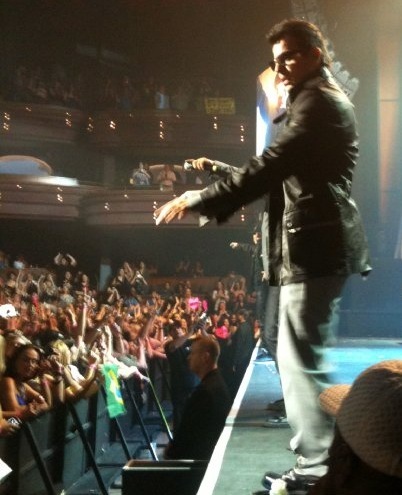 The second show of the CasiNO-Tour the next night on May 8, 2010 was SO much better, even though I wasn’t as close! It was just as exciting as the summer before when I saw NKOTB in Memphis. Musically the show was the same as the previous night, but NKOTB’s energy was so much better that second night in Vegas. I decided not to wait in the GA line, but I still arrived about an hour before the show was to start. I stood at the soundboard for the first half of the show, and then moved up a little closer to the stage for the second half. I had plenty of room to move around, so I was more relaxed than the previous night – and so were the five guys from Boston. NKOTB were having so much more fun than opening night. Donnie messed up the lyrics and laughed about it. Then Jordan messed up his dance and laughed about it. They made Jon sing Step Five of “Step by Step,” and this was after poor Jon fell off the platform near the soundboard during “Tonight.” As I was standing right next to the platform, I recorded “Tonight” and touched each New Kid as they jogged by me to get back to the stage. It was after this when I moved closer. NKOTB joked about all the fans complaining about the show only being an hour and fifteen minutes last night. This second show was almost an hour and a half, ending at 9:55pm. For all of my 200+ pictures from NKOTB in Vegas in 2010, click here. Check back here tomorrow as I reminisce about Jordan Knight’s solo show in 2012.